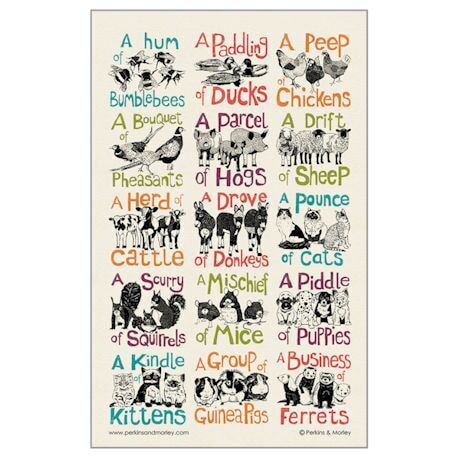 A piddle of puppies, "a mischief of mice," "a pounce of cats," "a scurry of squirrels…" We find collective nouns to be utterly delightful, so is it any wonder we loved this adorable tea towel from the United Kingdom? Fifteen illustrations of animal groups are paired with wonderfully apt collective nouns, inked in black with pretty pops of color on natural 100% cotton. The 18"x30" tea towel is guaranteed to add a dash of linguistic charm to your kitchen routine!